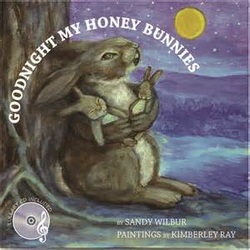 Everyone is invited to Kim Ray and Sandy Wilbur's new lullaby book release celebration at Northshire Book Store this Saturday June 27th at 6:00. Please share and extend this invitation. Thank you! Hope to see you there! Join us to celebrate the release of Goodnight My Honey Bunnies as the author and artist talk and present a slideshow about the collaboration and making of the book and music with a reception to follow. Designed to delight and soothe babies and children of all ages. Wonderful for shower, baby or birthday gift! Sandy Wilbur is an award-winning composer with over forty songs recorded and five chart singles to her credit. Kim Ray is a decorative painter specializing in “Custom Fine Art Work and Murals” and the mural artist that painted the two murals at the Northshire Bookstore in the Entrance & Children’s room at the Bookstore. 7:00p Reception wine and cheese reception and book signing to follow. Good friends and NTSUSA supporters, Anthony and Anne MacLaurin, opened up their home to share their project to revitalize a Scottish artistic legacy in America. Guest blogger Anne Macpherson, a dedicated member of Clan Macpherson Association, US Branch, brings us the story. 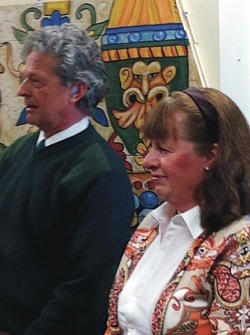 Anthony and Anne MacLaurin are both Scottish and lived in Scotland for over forty years. They are now settled in Manchester, Vermont, and they dearly wanted a “bit of Scottishness” to grace their new home. As a child, Anthony and his father loved to seek out and explore the wonderful castles of their homeland. One such example, Crathes Castle, made a lasting impression on the young Anthony as he gazed in wonder at the painted ceiling of this glorious place. Anthony kept those images in his mind for years and dreamt that one day he just might have a painted ceiling to call his own. In late 2011, he took steps to make this dream a reality. While in the Northshire Book Store in Manchester, Vermont, Anthony asked the clerk if he knew of any local artists who might be able to undertake such a massive project for the MacLaurin’s newly constructed dining room at Balquider, their nearby home. Following the clerk’s advice, Anthony and his wife Anne took a trip to Londonderry and the studio of the well-known muralist, Kimberley Ray, in May, 2011. Here began a journey through time and a year’s worth of research to create a new Scottish Renaissance-style painted ceiling. After delving into the history of the Renaissance in Scotland, Kim Ray consulted Scottish artists to unearth information about materials used and the iconography of the ancient murals. “While I researched many castles, it was Anthony’s dream to recreate the ceiling at Crathes Castle that he loved so much,” says Ray. “The mural was designed for the hexagonal ceiling of the MacLaurin’s dining room. Composed of eight triangular panels, it tells a story of magic and mystery, and illuminates what court life might have been like under James VI, later to become James I of England.” Kim worked out each trapezoidal panel keeping true to the authenticity of the imagery and time period. Each panel relates to the entire composition and the images are balanced from panel to panel. impacted Scotland in a marvelous way,” say Kim. “Suddenly artists were freed from age old ecclesiastical restrictions. The emerging creativity affected literature, music, architecture, art, and even fashion. The sky was the limit and ceilings were not left out as places for creative work,” explains Ray. The mural is composed of popular images of the period, many taken from Flemish pattern books. As speaking pictures, the ceiling details both Scottish and Classical themes. The figures represented on the panels are nature; the seasons; the five senses; virtues such as faith, hope, and temperance; and the Muses. The panels also feature the Nine Worthies: the pagan heroes – Hector, Alexander the Great, and Julius Caesar; Jewish Worthies – Joshua, David and Judas Maccabeus; and Christian monarchs – King Arthur, Charlemagne, and Godfrey of Boullon. These men were thought to represent all that was considered noble in life and were individuals who, at that time, were considered to be models of knighthood and chivalry. The panels also feature Robert the Bruce; the Rampant Lion of Scotland; a great stag, an ancient Celtic symbol of power and male potency; fantastic creatures including mermaids and sulkies; religious themes such as the Virgin Mary, Christ, the Church; and animals whose symbolism dates back to the Druids. The ceiling is also personalized with the MacLaurin crest and the owners’ initials. Several panels have Gaelic sayings such as Go mbeidh sochain ar domhain (May peace prevail on earth), Yer bums oot the windae (You are speaking rubbish), and Lang may yer lum reek (May you live a long life). Giving the composition her own special touch, several panels include a touch of Kim’s whimsy; a monkey who sees no evil and a little grotesque that gazes out of the opposite corner. The eight panels, separated by beautifully decorated borders, are united under a central boss in the form of the Tudor Rose – a friendly nod to the Anne MacLaurin’s English heritage. The paint that Kim used was the same material used during the period – known as flase. This paint delivers a permanent, intensely pigmented surface that has an overall matte finish. Now completely installed, Kim Ray’s year-long project lives proudly in the MacLaurin’s dining room. The painted ceiling at Balquhidder is a testament to one man’s dream and an artist’s fantastic talent and vision. Today Crathes Castle, the inspiration for the MacLaurin’s ceiling mural, is under the protection of the National Trust for Scotland and aided with American assistance through theNational Trust for Scotland Foundation USA. Kimberly Ray has been a decorative painter specializing in custom fine art work and murals since 2001 and is regularly commissioned for work throughout the United States and beyond. To learn more about the ceiling at Balquhidder click here. You can make a difference in preserving Scotland’s natural and cultural heritage today and every day by supporting the activities of the NTSUSA. Stay in touch with all the latest news and projects, we love to hear from you and don’t forget to join our online communities on Facebook, Twitter, Pinterest, andLinkedIn. passed since Londonderry artist Kim Ray first was contacted by a Manchester, Vermont homeowner and asked to create a mural for the homeowner’s newly constructed dining room addition. In that year, Ray has embarked on an artistic journey, researching 16th and 17th century Scottish Castles and folklore, even contacting mural artist Jennifer Merredew, who painted ceiling murals in Forter Castle in Scotland. Just over a year ago, the homeowner, formerly of Scotland, was in Northshire Bookstore, purchasing a book on the castles of Scotland. He asked the clerk if he knew of any local painters who might be able to take on such a project. The clerk pointed out the mural in the bookstore entrance, which the homeowner marveled “was fantastic.” It was painted by artist Kim Ray, of Londonderry. Not long after, in May of 2012, the homeowner and his wife traveled to Londonderry to meet with Ray and plan the mural. theme or a story. Each triangular panel is a trompe l’oeil style sky and cloud. The panels are all constructed of wide wood boards in the fashion of the wood paneled ceilings of Scottish Castles. It will be installed in the hexagonal ceiling in the dining room of a private home in Manchester. The Vermont Mural Governor Jim Douglas and his wife joined mural painter Kim Ray of Londonderry and over 250 community members to dedicate “The Vermont Mural” (24-foot by 6-foot ) located on the exterior side of the at Londonderry’s Mountain Marketplace on Sunday, November 28.
celebration of community.” Douglas mentioned Vermont has the fifth highest percentage of artists per capita in the country. All four seasons in the Green Mountain State are depicted with the Vermont coat of arms in the center. “This mural is very special to me as I feel so blessed every day to live in such a beautiful state. 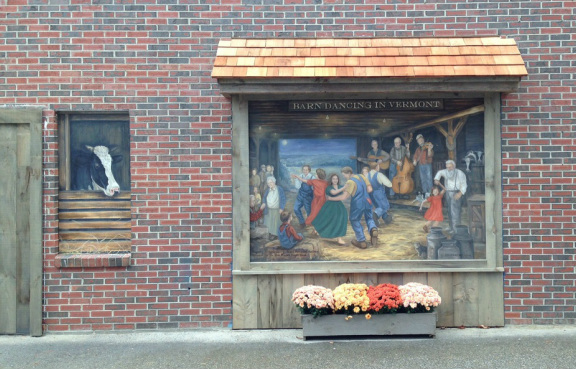 The mural honors the beauty of Vermont, its people and the way of life here,” Ray said. Mountain. Ray also put her rendition of the state’s coat of arms in the center of the mural. branches cross between the shield and the scroll. Ma Beans Vermont Pie Co.
Sevca – Who we are Inspired by the Franklin Delano Roosevelt Memorial in Washington D.C., SEVCA commissioned mural painter Kim Ray of Londonderry, Vermont to create a version of “The Depression Breadline” at its main office in Westminster, Vermont. The mural is dedicated to all those who suffer from financial crisis and to all the compassionate and generous people who share their abundance to help provide for those who have too little. In light of today’s economic crisis, many elements of which have been compared to the Great Depression, this visual expression of empathy for people experiencing the extreme hardships of poverty could not be more timely and appropriate. I see one-third of a nation ill-housed, ill-clad, ill-nourished. It is not in despair that I paint you that picture. I paint it for you in hope – because the nation, seeing and understanding the injustice in it, proposed to paint it out. We are determined to make every American citizen the subject of his country’s interest and concern: and we will never regard any faithful, law-abiding group within our borders as superfluous. Vermont Seasons LONDONDERRY — Artist Kimberley Ray is capturing Vermont’s seasons in two dimensions, but her painting is almost life-sized. Ray is painting a giant mural showing Vermont’s iconic spring, summer, fall and winter, including some Londonderry landmarks along the way. The painting is “a little over” 6 feet tall and 24 feet long, Ray said. She’s painting it in her special studio at the Mountain Marketplace, the same Londonderry shopping plaza that will be the painting’s ultimate home. Local businessman Robert “Bobby” Waite, a real estate agent, commissioned the painting for a blank wall on the side of the marketplace and also gave Ray a place to paint the mural at the small shopping plaza. Ray, who left teaching to paint full time several years ago, said some of her murals were so big she had to paint them on the floor of her house, and step over them going from room to room. Ray started the painting in mid July and said she hopes to have it ready by the beginning of September. To accommodate the harsh weather the mural will face, she is using high-quality acrylic paint and will finish it with a “wonderful” Swiss sealant to protect the painting from scratches. The paint is fade resistant, she said. The painting itself is being painted on MDO board. During a busy day last week, spring and summer were almost finished, showing a life-sized maple tree and bucket, and a steaming sugarhouse in the background. For summer, Holstein cows and a farm were featured prominently in the background, and she had sketched in the faces of two children swimming in a local swimming hole. Also sketched in was the Vermont Seal, which anchors the painting, as well the village of Londonderry, which will take its prideful spot as fall in all of Vermont’s signature colors. She had also sketched in Bromley Mountain, and the landmark red chairlift at Magic Mountain Ski area. She is also employing some artistic license in her painting of Londonderry, telescoping or relocating some notable spots in the interest of getting everything in. Ray said she included Londonderry’s two farms, the Middletown Farm and the Taylor Farm, and townspeople will have fun recognizing their homes or locations. One of Ray’s best-known murals is at Southeastern Vermont Community Action’s main office in Westminster. The painting, “1937 Bread Line,” was commissioned by Gloria Dawson, the former director of the anti-poverty agency, she said. She traveled to Washington, D.C., to study the sculpture by George Segal at the Franklin D. Roosevelt Memorial that the painting is based on. “I hope people will look at that mural and it will bring them an awareness of social action,” she said. Ray was also involved in the “Extreme Makeover” project for an Athens family two summers ago, painting the bedroom for the family’s older son, his bed was painted like a train and dubbed “The HurriKane Express,” in honor of the boy. Waite said that Ray presented him with some sketches of the proposed mural, and he asked her make it more like folk art. And to use her creativity. Since Ray opened her downtown studio, the painting and Ray’s friendliness has drawn a lot of curious townspeople, Waite said, and people interested in not just watching but learning how to paint. The Art of Teaching Schools across the country celebrate Youth Arts Month in March, but at Ludlow Elementary School the arts are woven into the fabric of the curriculum. Earlier in the school year, art classes helped make props, and some students performed in Opera Theatre of Weston’s production of Rachel Portman’s opera. Everyone in the school attended a performance. But the school’s involvement with the work didn’t end when the curtain fell. That project culminates this spring with a residency by muralist Kim Ray, who is guiding the students in the creation of a wall mural that will transform the lobby of Ludlow Elementary School into an interactive Vermont ecosystem. Each grade has a particular focus. Kindergartners crafted dragonflies and tadpoles for the insect life of a pond. Sixth-graders created constellations for the nocturnal environment. Margaret Dunne’s third-graders focused on birds. Each student chose one, researched it and, using a “photo reference,” drew and painted the bird as realistically as possible. When the weather improves, the students will head outdoors to draw from nature. Lisa Hammond’s fourth-graders were fully immersed even before they began to work on the mural. In their classroom they researched facts about nocturnal animals and created two-dimensional posters and three-dimensional models of each animal’s family. Hammond added language arts into the mix by asking students to pick an environmental topic their animal faces as the subject for a writing project. These students do not suffer from what one recent author has referred to as a “nature deficit disorder.” Asked whether they spend time out in the woods, almost every hand around the art tables is raised. However, they don’t all necessarily meet professional artists like Kim Ray. “Bringing in artists and letting the students meet them is really great,” Dunne said. The school population has shrunk from 210 to 120 in the last six or seven years, she says, with 50 percent of the students receiving free and reduced hot lunch. Residencies like Ray’s have a minimal impact on the local school budget. The majority of the funds are provided by an Okemo Challenge Grant. The Parent-Teacher Group also provides support, as do local businesses. Parents are involved as volunteers and as sources for such items as the tree trunks that will frame the mural once it is completed. “This mural ties the curriculum and the community together,” Blodgett said. If, as Ray told the students, “all public murals have a message,” this one has several. The first, about the environment, is one that students will enjoy for years to come. But another is about what happens when students experience the arts as an integral part of the curriculum. A Work of Art From: Israel Congregation of Manchester. This mural was commissioned by Mindy and Alan Bloom and Phyllis and Steve Gottdeiner using funds provided by their friends celebrating the couplesʹ fiftieth anniversaries! The Blooms and Gottdeiners wanted to transform their gift into something meaningful that would make a lasting addition to our synagogue. They turned to Kim whose work is familiar to many of us from her murals around the Manchester area (such as in the entry to the Northshire Bookstore). For ICM, Kim was commissioned to make a mural that reflects Jewish life as it is experienced here in Southern Vermont and A Work of Art Rabbi Novak in Israel. In the center of the mural is a unifying element, the hills of Vermont and the hills of Jerusalem. The green hills of Vermont subtly merge into the brown hills that surround Jerusalem. Images of a classic Vermont town scene contrast with Jerusalemʹs Yemin Moishe neighborhood and the old city walls. In front of them stand two Jewish women, each lighting a Shabbat candle. Above them is a chamsa, with the words of the blessing ʺMy Adonai Bless and Keep Youʺ. Above is a dove, a symbol of peace. Surrounding the women is a journey through the Jewish year. It begins with a young person with a shofar, apples and honey symbolizing Rosh HaShanah. Yom Kippur is represented with people praying in our sanctuary (note: Kim came in and photographed the sanctuary and has done a beautiful job capturing our bimah as well as people praying). Sukkot shows a group of men conversing in a succah, one that has particularly lush natural decoration. Hanukkah gives us a young father and two children lighting the hanukkiah. Purim shows two young people and a megilla, a copy of the Book of Esther. The young boy is salivating over a large plate of hamentaschen; the young girl is engaging the grogger. Passover shows a family sitting down for a seder. For Yom ha Atzmaut, Israel Independence Day, a girl is shown waving a large Israeli flag. Finally for Shavout a person is shown reading the Torah. The mural was painted in Kimʹs studio and affixed to the wall by her crew using a process similar to mounting wallpaper. The mural is sealed to protect and preserve it from the more tactile among us who want to touch it. This is a tremendous gift to our congregation and also to Jewish life. Next time you are near ICM please stop in and see it for yourself.